Chef Justin Devillier is the Chef/Owner of La Petite Grocery, Balise Tavern, and Justine in New Orleans, and the 2016 James Beard Award winner for Best Chef: South. In 2004, Devillier joined the team at La Petite Grocery as a line cook and was promoted to sous chef after one year. Following Hurricane Katrina, he helped re-build the restaurant’s infrastructure, and in 2007 was promoted to executive chef. A short three years later, Devillier and his wife Mia took over ownership of the restaurant, housed in a century-old building with a storied history. At La Petite Grocery, Devillier puts his creative spin on traditional New Orleans cuisine with dishes like Turtle Bolognese, Panéed Rabbit, and Blue Crab Beignets. In 2014, he was awarded “Chef of the Year” by New Orleans Magazine. In early 2015 the Devilliers opened their second restaurant, Balise Tavern, named after the first French settlement at the mouth of the Mississippi River. Set in a 19th century Creole townhouse in the Central Business District, Balise is a modern New Orleans tavern that celebrates the port city’s unique access to a wide variety of ingredients. In early 2019, the Devilliers opened Justine in the New Orleans’ French Quarter. The bustling, food-hall style gathering place is the realization of Devillier’s long-time dream to open a restaurant in the South’s most lively district. Balancing sophistication and exuberance, his menu features the classic, craveable dishes found in the brasseries lining the streets of Paris with bold presentation. Even during her professional career in business, Devillier has always held various positions in the service industry spanning 19 years – most notably with the House of Blues and in restaurants such as Lilette, Juan’s Flying Burritos and Marigny Brasserie. She joined La Petite Grocery in 2009 as General Manager, and she and her husband, Chef Justin Devillier, took over ownership of the restaurant in 2010. During her tenure, La Petite Grocery has also been included on Brett Anderson’s “New Orleans’ Top 10 Restaurants” list by The Times-Picayune for 2011, 2012, 2013, and 2014, and in 2016, Chef Justin Devillier was the James Beard Award winner for Best Chef: South. Mia and Justin Devillier’s second restaurant, named Balise Tavern after the first French settlement at the mouth of the Mississippi River, opened in the Central Business District of New Orleans in early 2015. Set in a 19th century Creole townhouse, Balise features a menu that celebrates Orleans as a port city and its unique access to a wide variety of ingredients. In early 2019, the Devilliers opened their third restaurant, Justine, in the New Orleans French Quarter. Justine is a brasserie reminiscent of those found on the streets of Paris, combining the sophistication of French culture with the playfulness of the French Quarter. The Devilliers spent time in Paris to hand-select the details for in the multi-roomed space, which will house a sidewalk café, open kitchen, and intimate bar. The Devilliers aim to create a bustling space enjoyed to by all, whether it’s for a weekday lunch, afternoon glass of wine, or celebratory dinner. Devillier attributes her passion for food and wine to her late father, Harley, and her knack for Southern hospitality to her late grandmother. In their honor, she continues her pursuit of providing memorable dining experiences at her three restaurants. Executive Chef Daniel Causgrove has always been drawn to French cuisine; from travels to France as a student to working in the esteemed kitchens of Le Cirque and Café des Artists in New York City, Causgrove deeply loves and appreciates the technique and simplicity of French cooking. While working as a Sous Chef under Chef Justin Devillier at La Petite Grocery, he and Devillier would often talk of opening a true French Brasserie one day in their beloved town of New Orleans. Years later, the dream is finally being realized as Devillier just opened Justine, a Parisian food hall in the heart of the New Orleans French Quarter. Causgrove leads the kitchen as Executive Chef. Causgrove grew up in Syracuse, New York and earned a Bachelor’s degree in Environmental Studies and English from St. Lawrence University in his home state. Following graduation, his active and adventurous spirit led him to the kitchen, and he quickly realized a career as a chef was the perfect fit. Combining his creativity with his passion for research, Causgrove sharpened his skills in Manhattan restaurants before heading South to New Orleans in 2007. Since his move to Louisiana, Causgrove has worked in the kitchens of some of New Orleans’ most lauded restaurants, including The Grill Room at Windsor Court, Cochon, La Petite Grocery, and most recently at the helm of American-Coastal restaurant Seaworthy at the Ace Hotel. 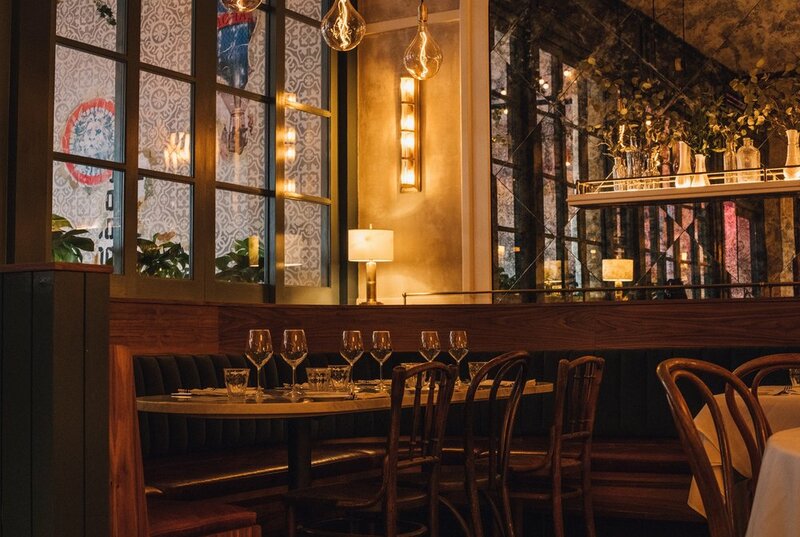 When the opening of Justine was announced in 2018, Causgrove returned to work for the Devilliers, where the idea of the Parisian Brasserie came to fruition through a menu of French classics with playful touches and exciting presentation. Throughout his career, Causgrove has been named a 2013 Chef to Watch by Louisiana Cookin’ magazine, honored as an American Culinary Federation 2013 Best Chef of Louisiana, and won Gambit Weekly’s 2015 Emerging Chefs Challenge. In his free time, Causgrove can be found tending to his “permaculture” style garden, riding and building bicycles, walking his rescued pit bull, Mona, and baking bread at home. Raised in the New Orleans area, General Manager Meghan Pecoraro always loved the sense of community created by mealtimes. True to her Louisiana roots, Meghan’s fondest memories revolve around her family’s crawfish boils that were more than just meals – they were celebrations. Meghan began her career in hospitality while attending Loyola University New Orleans, where she earned a Bachelor of Arts in Psychology and Criminal Justice in 2010. She took a job as a server at Houston’s Metairie in 2012 and quickly developed a passion for the thrilling, fast-paced environment of a bustling restaurant. Driven by a strong work ethic and a desire to create memorable dining experiences, Meghan’s career progressed during her 3-year tenure as both a server and bartender at Houston’s Metairie. Following Houston’s closure, Meghan joined the La Petite Grocery team as a server in 2015. Proving her ability to inspire team members, Meghan was promoted into management just a year after joining the restaurant. Leading Front of House operations, she focused on creating a culture of equality, teamwork and growth amongst employees, while working to ensure an unforgettable meal for each guest. After a successful three years at La Petite Grocery, owners Justin and Mia Devillier called on Ms. Pecoraro to serve as General Manager of their newest concept, Justine, a French brasserie in the famed New Orleans French Quarter. Opening in January 2019, Justine combines both elegance and exuberance, offering French classics in a grand, Parisian style food hall. As General Manager, Meghan Pecoraro will lead day-to-day operations of the vibrant, 200-seat restaurant, bringing her years of management experience to the opening team. Outside of the restaurant, Meghan stays active by playing sand volleyball and boxing, and spending time with her dogs. She also enjoys cooking home including fresh pasta and perfecting her brisket recipe. Pursuing new and exciting dining experiences, Meghan has a passion for great cuisine and libations. After graduating from high school and ready to stretch his legs, Carr moved to California to attend Santa Monica College and UCLA. He began bartending at local pubs – quickly discovering his fondness for hospitality – and after some post-college travel he landed in New York City to start working with some of the greatest people in the industry. In 2011, he found a home at the James Beard Award nominee Maison Premiere in Brooklyn, where he and fellow colleagues worked tirelessly to create one of the best bars in America and the world. In 2014, Carr and his wife decided to move to New Orleans, a city they fell in love with many years ago during Jazz Fest, where he began working for award-winning chef Justin Devillier and Mia Devillier. Four years later, he leads the beverage programs at all three of the Devillier’s restaurants as the Bar Director of La Petite Grocery, Balise Tavern, and Justine, a newly opened brasserie in the New Orleans French Quarter. At each concept, his creativity shines as he puts his own signature take on both New Orleans and French cocktail classics. Carr has participated in beverage events across the country, including BevCon and Tales of the Cocktail, where he was the recipient of the “State of the Art” award in 2018, presented by the Museum of the American Cocktail.